In the previous exercises of this series, forecasts were based only on an analysis of the forecast variable. Another approach to forecasting is to use external variables, which serve as predictors. This set of exercises focuses on forecasting with the standard multivariate linear regression. (3) another problem can arise if autocorrelation is present in regression residuals (it implies, among other things, that not all information, which could be used for forecasting, was retrieved from the forecast variable). This set of exercises allow to practice in using the regsubsets function from the leaps package to run sets of regressions, making and plotting forecast from a multivariate regression, and testing residuals for autocorrelation (which requires the lmtest package to be installed). The model selection is based on the Bayesian information criterion (BIC). The exercises make use of the quarterly data on light vehicles sales (in thousands of units), real disposable personal income (per capita, in chained 2009 dollars), civilian unemployment rate (in percent), and finance rate on personal loans at commercial banks (24 month loans, in percent) in the USA for 1976-2016 from FRED, the Federal Reserve Bank of St. Louis database (download here). Load the dataset, and plot the sales variable. Create the trend variable (by assigning a successive number to each observation), and lagged versions of the variables income, unemp, and rate (lagged by one period). Add them to the dataset. (Note that the base R libraries do not include functions for creating lags for non-time-series data, so the variables can be created manually). Run all possible linear regressions with sales as the dependent variable and the others as independent variables using the regsubsets function from the leaps package (pass a formula with all possible dependent variables, and the dataset as inputs to the function). Plot the output of the function. Note that regsubsets returns only one “best” model (in terms of BIC) for each possible number of dependent variables. Run all regressions again, but increase the number of returned models for each size to 2. Look at the plots from the previous exercises and find the model with the lowest value of BIC. Run a linear regression for the model, save the result in a variable, and print its summary. Load an additional dataset with assumptions on future values of dependent variables. Use the dataset and the model obtained in the previous exercise to make a forecast for the next 4 quarters with the forecast function (from the package with the same name). Note that the names of the lagged variables in the assumptions data have to be identical to the names of the corresponding variables in the main dataset. Plot the summary of the forecast. The plot function does not automatically draw plots for forecasts obtained from regression models with multiple predictors, but such plots can be created manually. 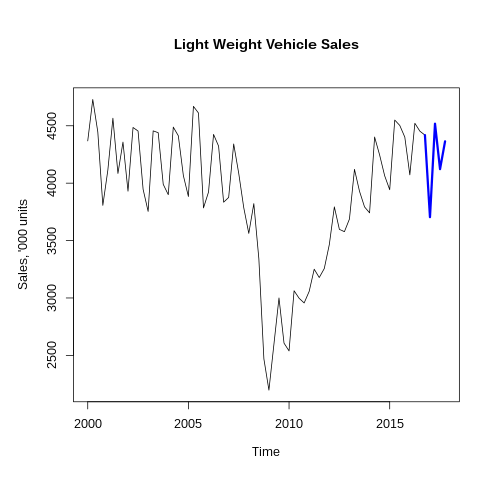 As the first step, create a vector from the sales variable, and append the forecast (mean) values to this vector. Then use the ts function to transform the vector to a quarterly time series that starts in the first quarter of 1976. (3) plot a thick blue line for the sales time series for the fourth quarter of 2016 and all quarters of 2017. Note that a line can be plotted using the lines function, and a subset of a time series can be obtained with the window function. Perform the Breusch-Godfrey test (the bgtest function from the lmtest package) to test the linear model obtained in the exercise 5 for autocorrelation of residuals. Set the maximum order of serial correlation to be tested to 4. (Note that the null hypothesis of the test is the absence of autocorrelation of the specified orders). Use the Pacf function from the forecast package to explore autocorrelation of residuals of the linear model obtained in the exercise 5. Find at which lags partial correlation between lagged values is statistically significant at 5% level. Residuals can be obtained from the model using the residuals function.